The Embassy of Hungary in New Delhi is pleased to announce the opening of their Visa Application Centres operated by VFS Global Services Private Limited in India. This site provides information on procedures applicable to applicants residing in India who wish to apply for a Short-Term Visa to travel to the Hungary. The visa applications can be submitted at the below mentioned Hungarian Visa Application Centres in India with a prior appointment. All applications will be assessed by the Embassy / Consulate of Hungary in India. With Effect From 15 March 2015, all the applicants need to lodge their visa application according to their jurisdiction. The processing of residence visas and some of the short-term visas requires a longer period of time. It could take even 30 days (in case of incoming visas - 60 days). Airport transit visa marking of visa: "A" - entitles the holder to enter the international zone of the airport and to stay there until the departure of the flight to the state of destination Special requirement: visa of the country of destination or other permit thereof authorizing the stay of the foreigner (if not exempt from the visa requirement) and airplane ticket showing confirmed reservation. Transit visa - marking of visa: "B" - may be single or multiple, entitling its holder to transit through the country in a period not exceeding five days on each occasion Special requirement: visa of the country of destination or other permit authorizing the stay of the foreigner (if not exempt from visa requirement). Short term visa - marking of visa: "C" - entitling the holder for single, double or multiple entry within six months and in case of an uninterrupted stay for a stay of maximum ninety days from the date of entry or in case of an interruption for a stay totaling no more than ninety days within six months from the date of the first entry taking all the entries into account. Residence visa - marking of the visa "D" - entitling the holder for single or multiple entry and for a stay exceeding ninety days but not exceeding one year for a specified purpose in Hungary without any additional permit. Visa issued to a foreigner for purposes of studying, teaching, scientific activity, training based on international treaty or international cooperation in the field of culture, education and science, or government level aid program, also this type of visa is issued to a member of the staff of the scientific, cultural institution operating in Hungary on the basis of international agreement. Work visa Special requirement: work permit, and see our "Information on work and self-employment visa." Self-employment visa Special requirement: see our " Information on work and self-employment visa." Student visa Special requirement: letter of admission or certificate of enrolment issued by the Hungarian educational or research institution, proof of payment of the tuition fees, proof of the possible scholarship, the address of the accommodation in Hungary (dormitory, apartment or hotel, the title of the residence). Medical treatment visa Special requirement: certificate of the receiving Hungarian medical institution stating that payment for the expected costs of the treatment is secured. Visitor visa Special requirement: letter of invitation (approved by the Hungarian alien policy authority) from a Hungarian citizen, or an immigrant, or a foreigner having a residence permit for a period of over one year in Hungary, or by a Hungarian legal entity. Visa for family unification Special requirement: Proof of being a family member. In case of a refugee recommendation of the refugee authority. Applications for short stay visa are accepted at the Hungarian Visa Application Centre. Before applying, please ensure you are clear on your purpose of visit. Do remember we are here to assist and help you to the entire visa application process but we are not permitted to advise or guide you on choosing a visa category. Since our work is primarily administrative in nature, we have no say on whether you will be granted a visa and how long it will take to process, as this is entirely the prerogative of the Embassy / Consulate of Hungary in India. You may refer to the link All about visas to understand details of various visa categories. Complete you visa application form and affix your photograph (not older than 6 months). You can download the Visa Application Form from our website. Minors shall submit an application form signed by both parents exercising permanent or temporary parental authority or legal guardianship. Present a declaration of permission by both parents exercising permanent or temporary parental authority or legal guardianship in the case the minor is traveling alone or the parent exercising permanent or temporary parental authority or legal guardianship in the case the minor is traveling with the other parent only. The declaration has to be original and certified by public notary. 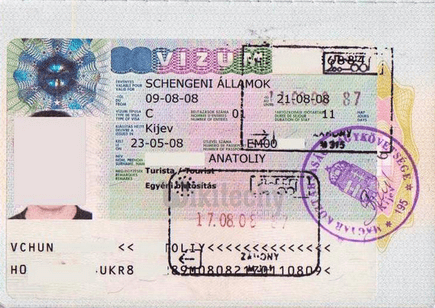 Original passport which validity shall extend at least three months after the intended date of departure from the territory of the Schengen States or, in the case of several visits, after the last intended date of departure from the territory of the Schengen States. Please check out before applying whether your passport contains at least two blank pages and it has been issued within the previous 10 years. Please ensure that you furnish the required document, you may download document checklist from our website. Passport collection policy applicable at all VFS Hungary Visa Application Centres in India. Your visa application is assessed by the Consular Section of the Embassy / Consulate of Hungary in New Delhi for up to 15 calendar days starting on the day the application is admitted by the Embassy / Consulate and not the one when it was submitted at VFS Global’s Hungarian Visa Application Centres in India. The Consular Section will notify you on the decision through the Hungarian Visa Application Centres in India once the visa procedure is concluded. Please be advised that during the time of the assessment the Consular Section of the Embassy / Consulate of Hungary in India will not answer any form of enquiry regarding the state or outcome of the visa procedure. However, if you have already submitted an application at the Hungarian Visa Application Centres in India you can track your application here by entering your Reference Number and your Date of Birth. Passports that contain manual entry (observation) changing any data of the biographical data page. Educational institution enrollment certificate referring to the permission granted for leave duly signed and stamped by an authorized person of the institution if the travel is taking place during the academic year (*). Certificate of registration in case of self-employed duly signed and stamped by an authorized person (*). Please make note that all documents marked with (*) have to be enclosed in original. representatives of non-profit organizations aged 25 years or less participating in seminars, conferences, sports, cultural or educational events organized by non-profit organizations and holders of diplomatic and service passports. VFS Global service charge per applicant is Rs.1503/- (Inclusive of service tax 14.50% and education process) which needs to be paid in cash. Please note fee are not refundable. Visa requirements depend upon the foreign individual’s citizenship and his or her intended length of stay in Hungary. The Schengen Agreement regulates Hungary visa application process. Schengen visas, regardless of which member country issues them, are valid in all member countries for a short-term stay, not exceeding 90 days. You can see categories of visas on the map. If your Hungary job search and application for the Hungary visa and Hungary work permit have been successful, you should start preparing for the Hungary job interview. Do not forget to take a look at Hungary dress code because how you dress is the one of the most important attribute in being hired. Good luck with your Hungary visa!